It is 'Wisden time' once again. Wisden Cricketers' Almanack 2017, the 154th edition, is the sixth under the editorship of Lawrence Booth, who has done a competent job. With its iconic yellow jacket and with all the usual indispensable features, the Wisden Cricketers' Almanack has been published every year since 1864. Another enduring Wisden tradition dating back to 1889 is the selection of Five Cricketers of the Year. The said award is considered as Cricket's nearest approach to a Hall of Fame. By tradition, the selection made by the Editor, is based primarily on the performance during the previous English season and in the Test series involving England. Quite naturally, there have been more Englishmen than others in this anxiously awaited Bible. No player may be chosen twice. Ben Duckett, Chris Woakes, Younis Khan, Misbah-ul-Haq and Toby Roland-Jones have been named as the five cricketers of the year. This year's volume runs to 1,536 pages and was for the first time, printed in Italy. The first section of the almanack commences traditionally, with the usual Notes from the Editor and this year, Lawrence Booth again takes us through his view of what might be called the state of play of the game with all the changes and often conflicting pressures trying to integrate together in order to move the game forward. Former Wisden editor Matthew Engel looks back on 60 years of Test Match Special. He calls the programme "a miraculous survivor" even though the programme has altered radically since the days of John Arlott and company. Matthew believes "there is a fundamental difference between the broadcasting of cricket on radio and on television, and it has grown wider with the years. On TV, the orthodoxy is that This Is Thrilling And It Really Matters, no matter what. On radio, there is a tacit pact with the listener, who will be registering the cricket as an agreeable extra in their own day-to-day routine." Hanif Mohammad, Trevor Goddard, John Gleeson, Martin Crowe, Tony Cozier, Donald Carr, Ken Higgs, Imtiaz Ahmed, Leonard Moon, Deepak Shodhan, Max Walker find a place in the Obituaries' section. Vic Marks, who has played for Somerset and England, has paid a rich tribute to Tony Cozier (1940 to 2016) in his article, namely, Master of all trades: "To watch him at work at a Test match was an education. He would move from the TV commentary box to the press room to the radio box, never hurried, yet never stopping. He mastered all three disciplines long before most of those around him had entered a media centre. Yet he will be remembered most for his work on radio. He had all the tools of the great broadcaster, among them that soothing voice and fount of knowledge unsurpassed by any other commentator or summariser of my experience." The cricket books, released last year, have been reviewed by Marcus Berkmann. Following On: A memoir of teenage obsession and terrible cricket by Emma John has been adjudged the Wisden Book of the Year 2017. Virat Kohli was named the leading Cricketer in the World in 2016 - the third Indian to accomplish the feat - the first two being Virender Sehwag in 2008 & 2009 and Sachin Tendulkar in 2010. Last year, Kohli had averaged 75.93 in Tests; 92.37 in ODIs and 106.83 in T20Is. While profiling Kohli, Bharat Sundaresan commented: "Being India's captain - and Kohli is now in total charge, after M.S.Dhoni stepped down as skipper of the white-ball teams in January 2017 - is akin to being a realty star. He lives his life in the public eye, the cameras always turned towards him, the scrutiny never-ending. Yet Kohli has thrived. A lack of runs in England remains the only blip on his CV. And it would take an equally brave man to bet against him setting the record straight when India return to England in 2018." Ellyse Perry was named the leading Woman cricketer in the World in 2016. Profiling her, Raf Nicholson remarked; "Though in recent years her batting has brought fame, Perry began as a bowler, the spearhead of the attack. On debut against New Zealand in July 2007, aged 16, she became Australia's youngest international cricketer. In 2010, she was the leading wicket-taker when they won the World Twenty20 in the Caribbean, and claimed three for 18 in the final. She was vital in Australia's hat-trick of titles - two more WWT20s, one World Cup - between 2012 and 20-14, and will for ever be remembered for the 2013 World Cup final against West Indies, when with an injured ankle, she limped in for ten overs and took three for 19." Jon Hotten, while profiling Joe Root (after his 254 against Pakistan, has remarked: "He is being talked about as one of the best batsmen in the world across all formats - with Steve Smith, Virat Kohli, Kane Williamson and Abraham de Villiers." The Vivo Indian Premier League in 2015-16 has been covered by Anand Vasu while Domestic Cricket in India 2015-16 has been covered by R.Mohan. In a Crime and Punishment section - ICC Code of Conduct - Breaches and Penalties in 2015-16 to 2016-17, four Indian players figure - Rohit Sharma (twice), Hardik Pandya, Virat Kohli and Ravindra Jadeja. 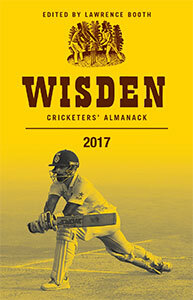 Wisden Cricketers' Almanack 2017 provides all the facts and figures of a year, meticulously compiled by Philip Bailey. Many happy hours can be spent absorbing the endless data.